It is that time of year again.... it's Stampede time again! Every year for the last 18 years, a group of Canadians have put on a party to celebrate the Calgary Stampede (officially that is, unofficially it's a party thrown by Canadians to show everyone else how to actually party). This party is big, really big. It will be attended by over 800 people, and there are less than 75 tickets remaining. 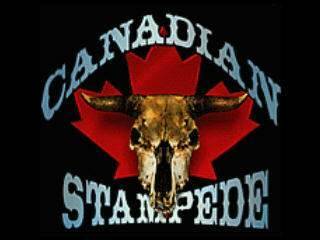 Thursday March 10th, from 7pm will see the latest instalment of the Canadian Stampede kick off to yet another stampede party. With special Canadian import DJ Hurricane from Calgary working the crowd, you can be assured that everyone will have a great time. Personally I'm looking forward to the Golder Garter Saloon shooter bar, which never fails to disappoint. And because those Canadians are so nice, they've given me 2 tickets to give away to you right here on Muscat Mutterings. If you want to come to the best party in town, leave a comment (with a method of me contacting you) or send me an email you must be aged 21 or over to attend this event. I'll draw the tickets on Tuesday the 8th in the evening. Is there any other way of getting tickets? new to Oman and would like to see something different like this. Nice! Winning these would be second only to winning the HiFM world cup tix. Fingers crossed! Geez, I thought I was the only Canuck in Oman! Do you think it will be too warm to wear my Mukluks? Will mail you my contact details! I wanna attend this event so badly... PLZ pick me!! !